50 STORIES ON DAILY LIFE IN COHOUSING FROM 25 DIFFERENT COMMUNITIES. THE FIRST "REPORT FROM THE FIELD" ABOUT HOW COHOUSING IS WORKING, WRITTEN AND PHOTOGRAPHED BY PEOPLE WHO LIVE THERE. EDITED BY 10-YEAR COHOUSING RESIDENT DAVID WANN, THE CO-AUTHOR OF AFFLUENZA AND SUPERBIA! 31 WAYS TO CREATE SUSTAINABLE COMMUNITIES. "Cohousing communities offer an alternative American Dream where residents work collaboratively to create strong, vibrant neighborhoods that use fewer resources and provide more-supportive environments. David Wann"s book offers valuable insights into why people are not only drawn to this type of neighborhood but have taken considerable risk and effort to create cohousing neighborhoods. It shows us both the mundane and extraordinary aspects of creating and living in community in contemporary America." -- Kathryn M. McCamant, cohousing architect, developer, and co-author of Cohousing: A Contemporary Approach to Housing Ourselves. "Reinventing Community is an accessible and inspiring book, a rich tapestry of voices and insights from modern pioneers who are creating human scale villages, friendly to people and the sustainability of life on this planet. "The folks David Wann profiles in Reinventing Community are the vanguard for the future -- they're learning today, often by painful and sometimes humorous trial and error, what it takes to go beyond the solitary and alienated survival tactics of modern urban life to the full flowering of the human spirit of tomorrow, in community." -- Eric Utne, founder of Utne magazine and editor of Cosmo Doogood's Urban Almanac. "Dave Wann"s fascinating smorgasbord of lively, engaging first-person tales helps us understand why small cooperative neighborhoods like these have such vital appeal"and why cohousing is now the fastest-growing kind of intentional community in North America today. This anthology is also one of the best overviews of community living I"ve seen yet"the small unexpected pleasures; the ongoing sense of connection; the steady support of neighbors and friends; the safety, especially for older people and children; children always having many near-siblings at hand to play with; the potential clout with local officials"as well as the inevitable conflicts, challenges, heartbreaks, and innovative community solutions." --Diana Leafe Christian, editor of Communities magazine and author of Creating a Life Together: Practical Tools to Grow Ecovillages and Intentional Communities. 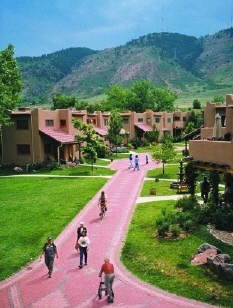 Copyright 2005 Reinventing Community: Tales from the Walkways of Cohousing. All rights reserved.